Creating system schematics with free templates and examples. System schematics has never been easier. A systems diagram is similar to a flow chart on first sight although it is much simpler and more precise. System Diagrams are more than process flow charts for they include feedback loops and other factors that influence how decisions are made, including attitudes, perceptions, and behaviors. Simply speaking, a system diagram is a representation of how a system will work. Creating System Diagrams is the first step to develop the system thinking skills needed to understand and manage these complex phenomena. System diagrams are powerful tools that help people to understand how complex systems work by providing a common language for people to think about these complex issues. System diagrams are particularly helpful in showing you how a change in one factor may impact elsewhere. 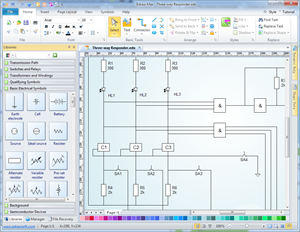 Edraw provides quick-start templates, exhaustive symbol library, and drag-and-drop method, allowing you to create professional annotated electrical schematics, maintenance and repair diagrams, and utilities infrastructure designs easily, which can be printed, shared online, or exported to PDF or other graphics formats. 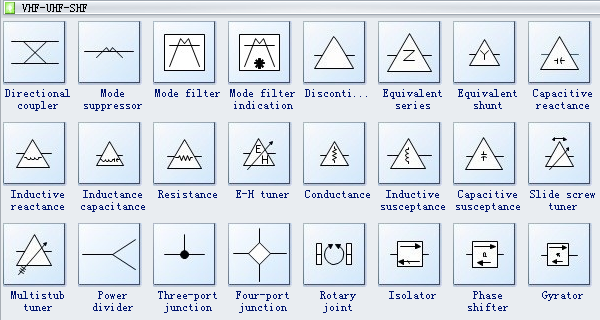 Edraw software includes lots of VHF-UHF-SHF shapes, directional coupler, mode suppressor, mode filter, mode filter indication, discontinuity, equivalent series, equivalent shunt, capacitive reactance, inductance capacitance, resistance, E-H tuner, conductance, etc. All these shapes will be good assistants for you to draw the diagram you want.